Find stainless steel bump rails from McCue to stop carts and other rolling equipment in their tracks. Our modern crash rail designs offer a contemporary look without sacrificing the strength necessary to protect your store from accidental damage. Keep your store looking great and give your walls and fixtures a longer (and happier) life. Retail, grocery and club stores alike can benefit from installing a bumper rail system, especially during peak store hours. As patrons hurry to do their shopping, accidents can happen. A secure crash rail not only protects your inventory, case displays and stands, but the stainless steel finish offers a modern touch. The CartStop Stainless Steel Rail from McCue is engineered with you in mind. 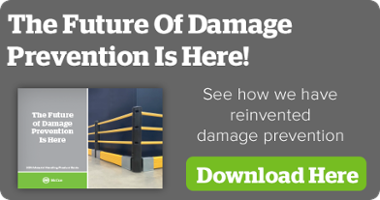 It absorbs every bump, dent and scrape while protecting your facilities from damage. Installation is simple—you can ditch the cement and adhesives. Instead, simply drill in the anchor flange/sleeve assembly. It’s semi-permanent and can be easily replaced. Choose from 2′, 4′, 6′ and 8′ lengths. Best of all, it requires minimal upkeep and still retains its stunning look. CartStop Super is your go-to solution for high-traffic areas. Protect your most expensive assets with this aluminum rails. Its polycarbonate inserts and stainless steel legs absorb the impact from heavy equipment and redistribute energy. It can be easily removed for cleaning and installation is a snap. It’s recyclable and environmentally friendly. Why Sets McCue Products Apart? At McCue, we take pride in the products we provide to stores and warehouses. Since we opened our doors in 1988, we’ve pledged to make it a pleasure to work with our team by providing excellent customer support and a superior line of solutions. Request a catalogue or browse our collection of retail and material handling solutions online to see what makes McCue different from our competitors. Contact us today to learn more about our stainless steel bump rails!